An article by Sean Bresnahan on the upcoming Tyrone event to commemorate two IRA volunteers who died in 1973. For the Pensive Quill. Some noise going on here in Tyrone this week as the DUP’s Tom Buchanon leads the charge against the “glorification of terrorism” with his party driving itself wild at the prospect of a parade passing through the town of Castlederg to commemorate local IRA Volunteers Seamus Harvey and Gerard McGlynn, who died in a premature explosion 40 years this month. Having sung of these two men for years when down in the GAA social club in Aghyaran it’s with pride that I’ll attend the independent commemoration on August 11th at the spot where they died. These men have held a special place in my heart since first I heard my mother sing the ballad written in their memory many years ago so I’d hope as many of us as can make it will be there to pay a fitting respect to these lads who paid the ultimate cost for the people of Tyrone and Ireland. 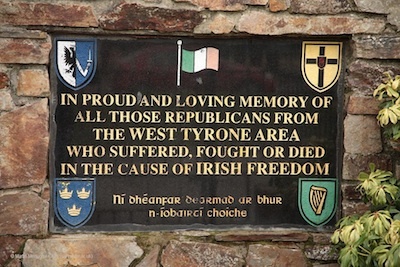 But one place I’ll not be is at the Sinn Fein sponsored event later that evening as they once again hijack the memory of Tyrone’s Volunteer dead for their own party-political interests. In that respect for once I’m of the same mind as the arch-bigot Buchanon, this parade has no place in Castlederg - but not for the reasons good old Tom would have us believe. Sinn Fein have no business using and abusing the names of Harvey and McGlynn given the recent outburst of Belfast Lord Mayor Mairtin O’Muilleoir, when he condemned the tactics of the IRA during its armed campaign, and those of his erstwhile leader, the Big Lad himself, when he was made a fool of by Miriam O’Callaghan on RTE and tried to rescue his credibility by disowning the very men who put him where he is today - by describing them as murderers. Together they have criminalised the Harvey’s and McGlynn’s of our struggle, they’ve done what the British couldn’t when they attempted this very same thing in the H-Blocks of Long Kesh. As I write this I’m mindful of Kevin Lynch from Dungiven, who’s anniversary falls today, a man who died to prove that what Gerry Adams now believes to be true was nothing but a British falsehood. So they have no place making political speeches in Castlederg to lay claim to Seamus Harvey and Gerard McGlynn and they’ve no place laying claim to the Volunteers of Oglaigh na hEireann with their so-called ‘Tyrone Volunteer’s Day’ - not when the party leader agrees that when Martin McCaughey and those who fought alongside him took out a team of SAS (yeah those same soldiers who apparently died in a car-crash in Germany or somewhere) they had somehow become ‘murderers’. No doubt Lynagh, McKearney, Gerry and Martin Harte, Declan Arthurs and Big Brian Mullin were murderers too or had murder in their mind’s constitution. Some of us still beg to differ. When O’Muilleoir condemned the IRA’s tactics part of what he remonstrated against was its bombing campaign, yet Seamus Harvey and Gerard McGlynn died transporting a bomb. Just last month we commemorated the lives of Paddy Carty, Sean Loughran and Dermot Crowley, who died in a premature explosion in Omagh when the bomb they were carrying went off as they made their way into the town. Many other Volunteers died in similar circumstances. Effectively what O’Muilleoir and Sinn Fein have done is to condemn them all, and just so they could appear as the honest John’s with their phony ‘outreach to Unionism’ - which Unionists themselves can see is nothing but a dishonest ploy. You see the problem is they want their cake and they want to eat it. They want to stand in front of the media and portray themselves as the honest brokers even should that mean disowning the IRA and its actions, even going so far as to call them murderers - McGuinness and Adams have both went along with this on the record in recent times. But then on the other hand and to a different audience they want to claim these men as their own, to stand making speeches in their memory, to tell us how their sacrifice has been redeemed by the progress Sinn Fein has made in recent times and the position the party now finds itself in. It’s nothing but wanton hypocrisy, you simply can’t have it both ways. People are tired of it. No doubt the adverse publicity from the Unionist outcry will aid Sinn Fein in it’s efforts to lay claim to the Volunteer’s of Tyrone, no doubt it will help draw a sizeable crowd to help massage their badly mauled ego. Because the republican people of Tyrone can see right through them in ever-increasing numbers and they know it. It’s likely for this reason that they chose to shift ‘Tyrone Volunteer’s Day’ from its traditional slot. It was once a touchstone event in the republican calendar, held annually on the anniversary of IRA Hunger striker Martin Hurson in the tiny republican stronghold of Cappagh in the hills of East Tyrone. Given the paucity of numbers in attendance as the years have gone by, as the people of Galbally and its hinterland made their feelings known by the sound of their boots walking out the door, Harvey and McGlynn will instead be exploited to make the great and the good of Sinn Fein feel better about themselves. I just hope that those who attend to hear Gerry Kelly tell how the fight of Seamus Harvey and Gerard McGlynn still goes on, while he and his party administer British rule, legitimise the RUC, internment, strip-searching of prisoners and all the rest, take a few moments to consider how Adams, McGuinness, Kearney, O’Muilleoir and co. have disowned everything these lads went out and tried to do in the rush to make themselves yet more acceptable to that same British foe the Volunteers of Tyrone went out and fought to get rid of.